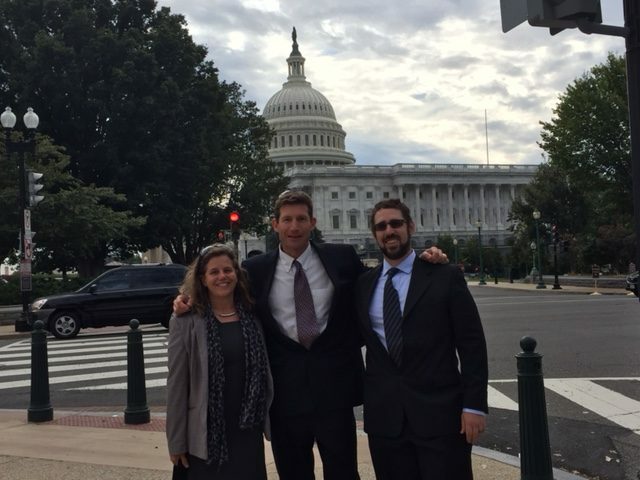 Ashley Korenblat, Managing Director for Public Land Solutions, recently accompanied two outdoor industry business leaders to Washington, DC to present the Outdoor Industry Business Letter on Energy Reform, which was signed by 30 of the biggest outdoor companies in the nation. Ashley, along with Aspen Skiing Company’s Auden Schendler (center) and Andrew Baxley (right) of Osprey Packs, met with officials such as Neil Kornze, Director of the Bureau of Land Management (BLM) and the White House Office of Energy and Climate Change Policy to give them the letter, which applauded the administration’s continued efforts to make energy development safe, productive, and efficient. Specifically, the group focused on five categories presented in the letter: the Programmatic Environmental Impact Statement on coal; renewable energies; the Stream Protection Rule; Master Leasing Plans for oil and gas; and the upcoming Methane Rule. The Obama administration has demonstrated its commitment to developing strong energy regulations that ensure a fair return for taxpayers, as well as keep energy development from impacting other industries negatively. This is especially important in the Western states, where recreation is growing as a stable economic driver, in addition to the energy industries. As recreation continues to grow, using smart-from-the-start planning for energies and resource extraction will become even more important. Smart planning will also be vital as the population, and therefore demand, grows. Public Land Solutions, and our partners, are extremely grateful for the hard work and collaboration from this administration on energy reform.